Computer Vision « Global Market Insights, Inc. 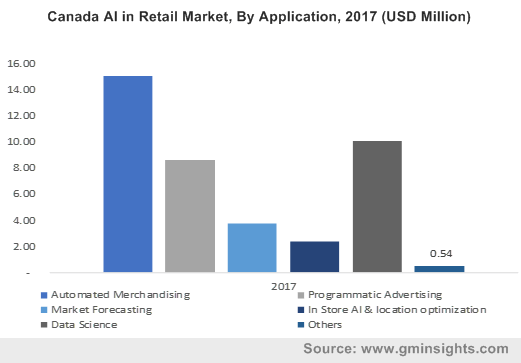 The excellent growth dynamics of the global artificial intelligence (AI) in BFSI market can be traced by the recent instance of Metromile, a leader in pay-per-mile car insurance in the U.S., launching its new AI-based smart claims assistant, AVA. The automated system reportedly utilizes machine learning capabilities to reconstruct the accident scene and promptly ascertains if claim details are true. Apparently, the claim is approved within seconds after the details are verified and the AI-based tool further notifies the car owner of the expedited claim. With the increasing adoption of high-grade technologies such as IoT and Big Data, the commercialization potential of AI in BFSI industry has observed a marked uptick in the past few years. Elaborating further, the unveiling of AVA signifies the transformative phase being witnessed across the worldwide insurance sector where prominent AI in BFSI industry players have been increasingly deploying advanced algorithms to enhance the underwriting process. 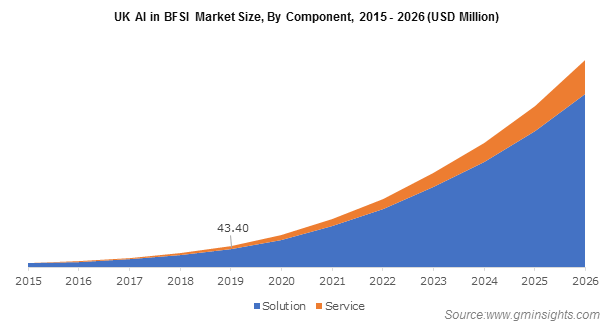 This has, in turn, impelled the insurance segment of the AI in BFSI market which is forecast to register an outstanding y-o-y growth rate of over 38% during 2018-2024. Embarking on its AI and automation journey in September 2017, State Bank of India unveiled its first AI-powered chat & voice assistant, named as SBI’s Intelligent Assistant or SIA. The chatbot reportedly aids customers with everyday banking tasks just like a bank representative and has a remarkable capacity to handle close to 10,000 enquiries per second or 864 million in a day. Arguably, the deployment of an AI-based solution of this scale is cited to be first of its kind in the banking segment of the global AI in BFSI market. With an astonishing customer strength of around 420 million, State Bank of India’s latest move towards integrating AI is being viewed as a major leap of faith for India’s banking sector. Regarded as one of the world’s largest banks, the U.S. based JPMorgan Chase has recently launched a digital platform that analyzes legal documents and extracts the relevant data. The AI-based invention, named as Contract Intelligence (COiN) platform, is an outcome of the initial implementation through machine learning technology and has an exceptional ability to revise approximately 12,000 annual sales agreements within minutes. The platform is being aptly termed as revolutionary across AI in BFSI industry given the fact that it effectively eliminates the need to manually review the said number of sales agreements which generally takes around 360,000 hours. Owing to the launch of intuitive, easy-to-use, and highly-efficient AI-based tools, the banking segment of the AI in BFSI market has been proliferating at an exceptional pace in the recent times. In fact, as per a research report compiled by Global Market Insights, Inc., the banking segment apportioned more than 50% of the total remuneration portfolio of AI in BFSI industry in the year 2017. With the unveiling of advanced AI technologies that provide real-time insights into every aspect of banking operations and leverage the abundance of data to gain a granular understanding of consumer behavior, the banking segment is slated to lead the end use spectrum of this business space over the ensuing years. Infusing AI-based applications across a diverse set of operations has brought about a momentous shift in the ability of organizations, working in the BFSI domain, to swiftly analyze, comprehend, and respond to vast amounts of data which has consequentially augmented the revenue share of companies operating across AI in BFSI market. 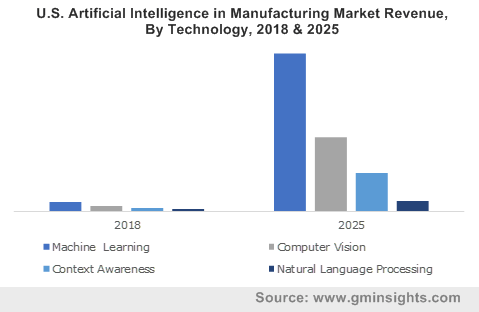 With the advent of advanced machine learning algorithms, data analytics solutions, natural language processing techniques, the AI in BFSI industry space is anticipated to register an overwhelming CAGR of 30% over the estimated timeframe. This entry was posted in Sustainable & Smart Technologies and tagged AI in Banking, AI in BFSI Market, AI in BFSI Market Size, Artificial Intelligence in Banking, Artificial Intelligence in BFSI Market, Artificial Intelligence in BFSI Market Analysis, Artificial Intelligence in BFSI Market Report, Artificial Intelligence in BFSI Market Research, Artificial Intelligence in BFSI Market Share, Back Office Operation, Bank, Chatbot, Compliance & Security, Computer Vision, CRM, Customer Behavior Analytics, Customer Relationship Management, Customer Service, Data Analytics & Visualization, Financial Advisory, Fraud Detection, Insurance, Machine Learning, Managed Service, Natural Language Processing, NLP, Professional Service, Risk Management, Service, Solution, Wealth Management.